Yay! It’s been raining for nearly two days and finally starting to feel like Fall. Plus the grass we seeded no longer needs our hand at watering. 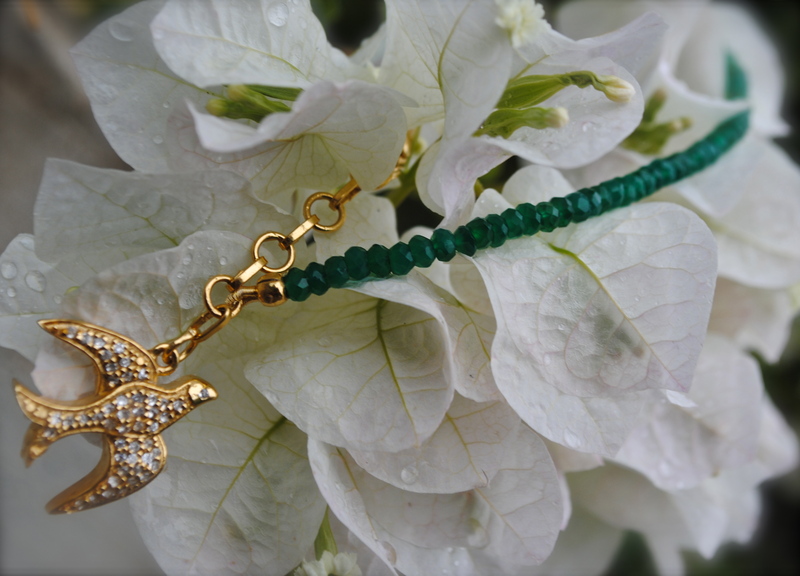 (we hope) Anyway, I got to chance to wear my new freddie&cinnamon sparrow charm green onyx bracelet which I love! I enjoy promoting this jewellery company and will continue to rant&rave about their products and friendship which is what this charm and their other charms represent. Be sure to take a peak at Olga’s and Magda’s collection here. Perhaps you need to send someone a sentimental gift that represents your friendship? Trust me these delicate beauties are a keepsake for years to come…..
With the rain starting to pour, we didn’t have enough time to take more pics of my outfit but eventually you’ll see these key pieces again very soon. The trench coat is a must have every year and who doesn’t love a warm wool brim hat? I’ve been in Germany for 2 weeks for some R&R. I have so many blogs to catch up on! You look fantastic in hats, and that bracelet is so sweet and dainty! TY! Hope all is well, I’m in Germany with poor access to internet. So I have a lot of catching up to do. Love that bracelet! I also have a love of birds and just recently realized that there are people out there that hate or fear them. Strange. I adore them. I make personalized greeting cards and my mark on them are birds. It would feel amazing to fly wouldnt it? Sky diving? No WAY! Love the minimalism jewelry style! I’M F&C would appreciate it and thank you. The charm braccelet is really cute! Stunning as always, the hat and charm. I have an affinity for the sparrow, but that’s another story. Nice :). Love the hat too!